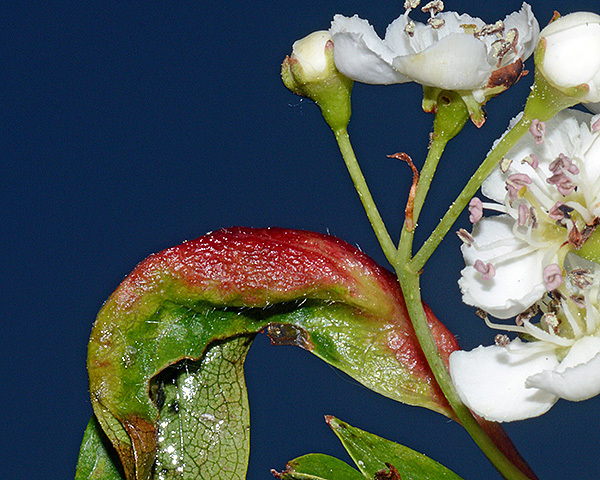 The fundatrix of Dysaphis angelicae induces a cherry-red to crimson curled-leaf gall on hawthorn (see first picture below). Neither the leaf gall nor the fundatrix of Dysaphis angelicae can be distinguished from others of the Dysaphis crataegi species group (the hawthorn-umbellifer aphids: Dysaphis angelicae, Dysaphis apiifolia, Dysaphis crataegi, and Dysaphis lauberti). 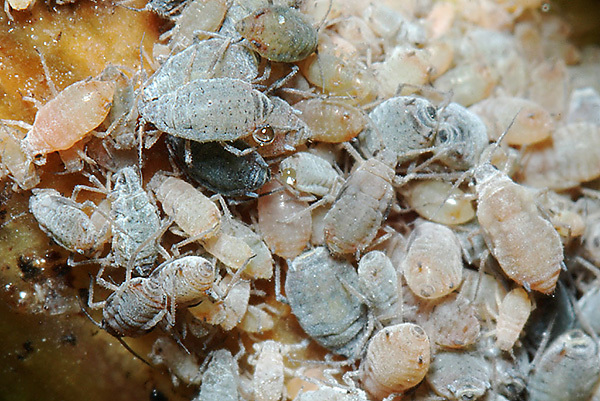 The plump fundatrix of members of this group is bluish grey and densely powdered with wax. Their antennae are short at about 0.3 times the body length. The terminal process is 1.3-2.0 times the base of the last antennal segment. The siphunculi are quite short, about 0.08-0.09 times the body length and 1.4-1.8 times the cauda. The body length of the fundatrix is 1.7-2.3 mm. The generation produced in the gall are similarly heavily waxed (see second picture below) and nearly all develop to winged forms, known as 'spring migrants' or emigrant alates . The alate can be identified to species. The Dysaphis angelicae emigrant alate has the bands on its doral abdomen fused to form a solid black patch (see third picture above). 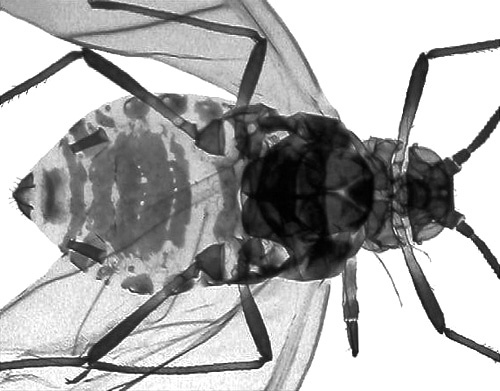 The longest hair on abdominal tergite III is more than 40 µm long (cf. Dysaphis apiifolia, and Dysaphis crataegi, where that hair is 40 µm or less). The total number of secondary rhinaria on antennal segment V (adding both sides together) is 0-31, but is never less than 6 in spring migrants, and usually exceeds 9 (cf. 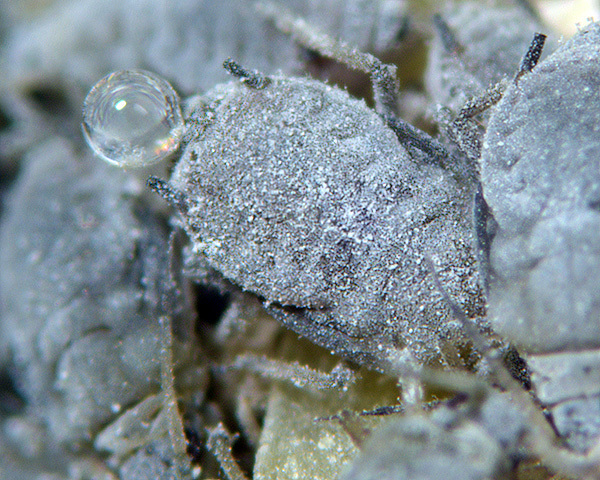 Dysaphis lauberti where the total number of secondary rhinaria on antennal segment V is usually 0-3, and never exceeds 9). 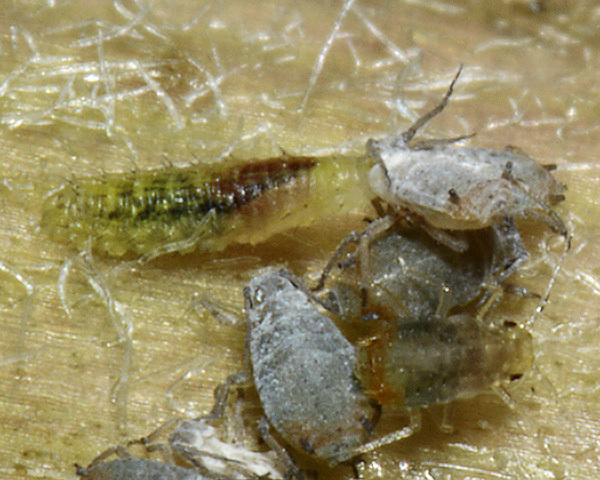 On their secondary host (angelica), Dysaphis angelicae adult apterae (see fourth picture above) are greyish green with some white wax powdering. They also have a little reddish suffusion around the around the siphunculi, but this is much more prominent in immatures. Their antennae are short - about 0.3 times the body length. Their siphunculi are also quite short at 0.083-0.12 times the body length, but their length is more than twice their basal width. 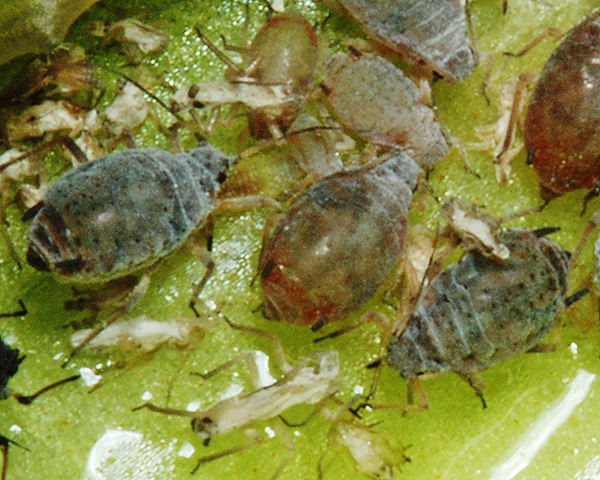 The clarified mounts mounts below are of adult viviparous female Dysaphis angelicae (on secondary host) : wingless, and winged. The hawthorn - angelica aphid host alternates between hawthorn (Crataegus spp.) as the primary host and angelica (Angelica sylvestris) as the secondary host. On the primary host Dysaphis angelicae induces a cherry-red leaf gall. All females of the second generation are winged and migrate. On the secondary host it forms colonies on the lower leaf bases. Dysaphis angelicae occurs throughout much of Europe. 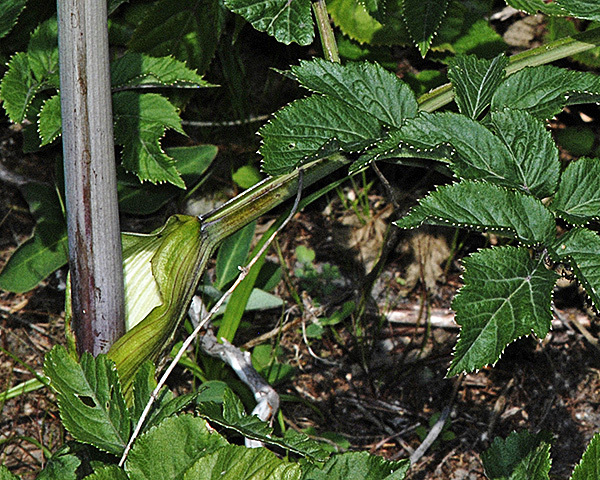 Unlike most of the species using hawthorn as a primary host, Dysaphis angelicae is restricted to a single hostplant species, wild angelica (Angelica sylvestris) as its secondary host. 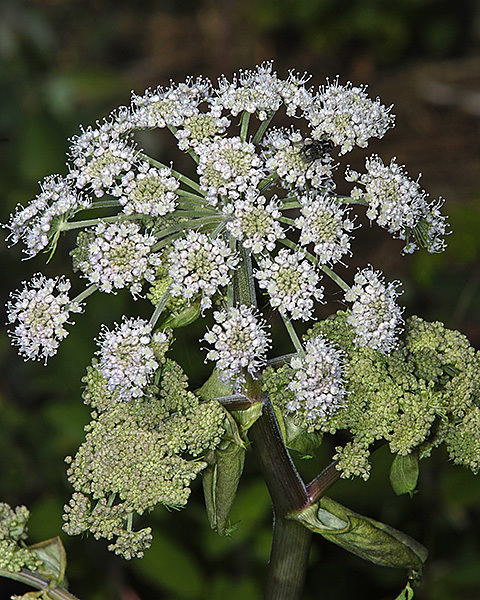 Wild angelica has white or pinkish flowers in umbels, and can be distinguished from related species by its hairless, ridged purple stem and its inflated sheathing leaf petioles (see pictures below). Dysaphis angelicae lives in quite large colonies on wild angelica between the sheathing leaf bases and the stem. The colonies are usually attended by ants. 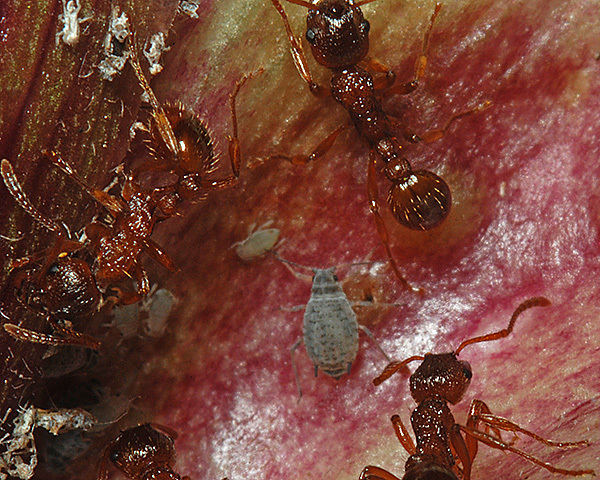 The picture above shows Myrmica ants in attendance of Dysaphis angelicae. Colonies are also commonly attended by the common black garden ant (Lasius niger) (see first picture below). 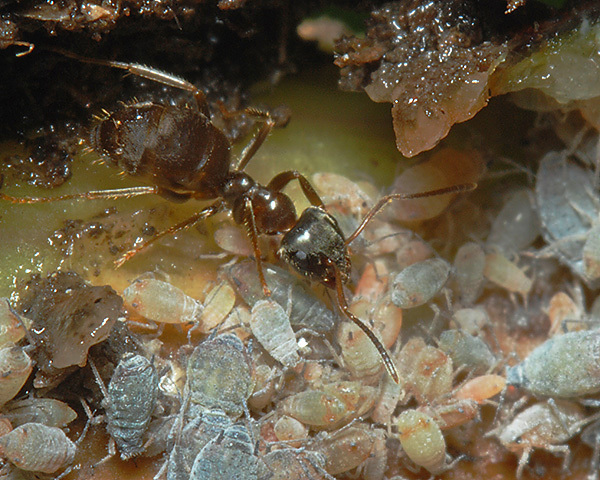 Depa & Wojciechowski (2008) found Dysaphis angelicae living inside the nests of Lasius niger. More rarely Formica ants are in attendance, as in the second picture above showing a southern wood ant (Formica rufa). 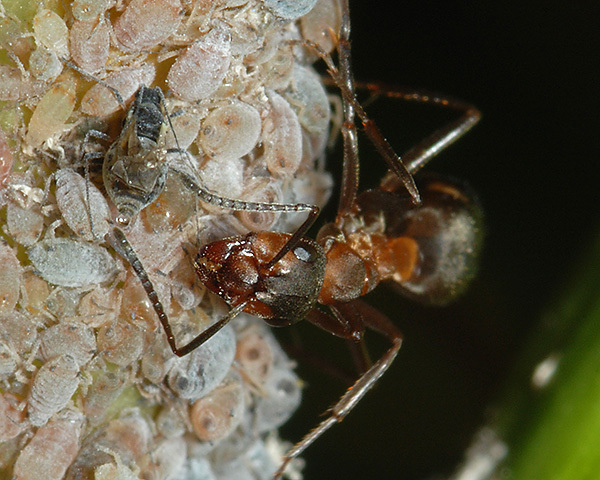 If ants are in attendance, there is seldom much evidence of predator activity. 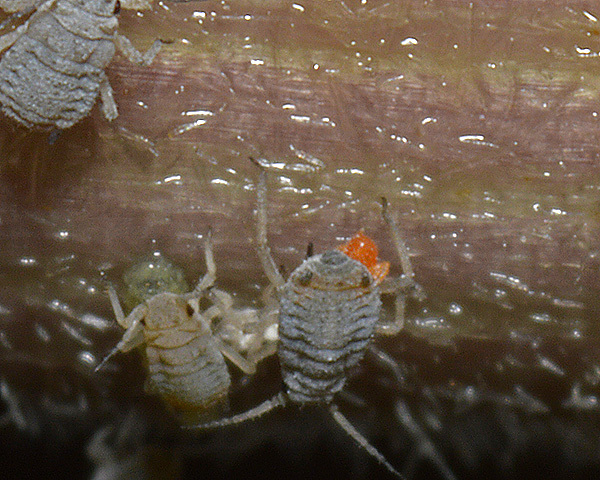 However, in one unattended colony we found some aphids were parasitized by trombidiid mites (see first picture above), and a few predatory syrphid larvae were present (see second picture above). Dysaphis angelicae has been recorded from 4 Crataegus species (Crataegus calycina, Crataegus laevigata, Crataegus monogyna, Crataegus pentagyna). Blackman & Eastop list 16 species of aphid as feeding on common hawthorn (Crataegus monogyna) worldwide, and provide formal identification keys. 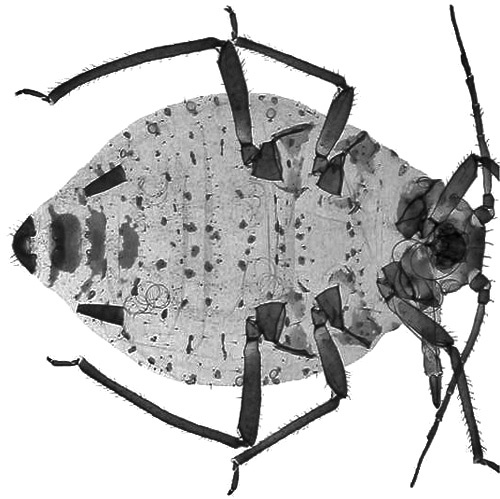 Of those aphid species, Baker (2015) lists 15 as occurring in Britain: Aphis fabae, Aphis gossypii Aphis pomi, Aphis spiraecola, Aulacorthum solani, Dysaphis angelicae, Dysaphis apiifolia, Dysaphis crataegi, Dysaphis lauberti, Dysaphis ranunculi, Ovatus crataegarius, Rhopalosiphum oxyacanthae, Ovatus insitus, Prociphilus pini and Rhopalosiphum rufulum. Dysaphis angelicae has been recorded from 2 Angelica species (Angelica archangelica, Angelica sylvestris). Blackman & Eastop list 15 species of aphid as feeding on wild angelica (Angelica sylvestris) worldwide, and provide formal identification keys. 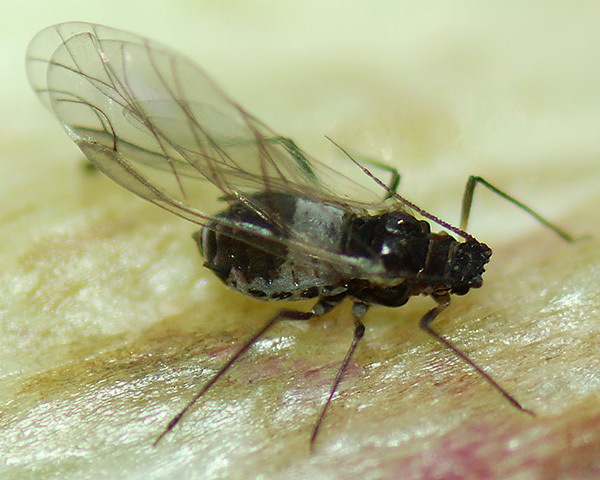 Of those aphid species, Baker (2015) lists 11 as occurring in Britain: Aphis fabae, Aphis gossypii, Aphis spiraecola, Cavariella aegopodii, Cavariella archangelicae, Cavariella konoi, Cavariella pastinacae, Cavariella theobaldi, Dysaphis angelicae, Hyadaphis foeniculi and Hyadaphis passerinii.